Polycyclic Aromatic Hydrocarbons: What Are They and Why Do They Matter? Polycyclic aromatic hydrocarbons (PAHs) are a class of more than 100 chemicals composed of up to six benzene rings fused together such that any two adjacent benzene rings share two carbon bonds. Why is a research focus on PAH mixtures so important? Hundreds of PAHs are present in environmental mixtures. PAHs account for 4 of the top 10 most hazardous substances on the 2011 ATSDR Priority List of Hazardous Substances. Although many studies employed single PAHs, humans are exposed to complex mixtures. Where do PAHs come from? The primary source of PAHs is from burning carbon-containing compounds. PAHs in air are produced by burning wood and fuel for homes. They are also contained in gasoline and diesel exhaust, soot, coke, and cigar and cigarette smoke. They are the byproducts of open fires, waste incinerators, coal gasification, and coke oven emissions. Foods that contain small amounts of PAHs include smoked, barbecued, or charcoal-broiled foods, roasted coffees, and sausages. What happens to PAHs in the environment? PAHs enter the air mostly as releases from volcanoes, forest fires, burning coal, and automobile exhaust. PAHs can occur in air attached to dust particles. Some PAH particles can readily evaporate into the air from soil or surface waters. PAHs can break down by reacting with sunlight and other chemicals in the air, over a period of days to weeks. PAHs enter water through discharges from industrial and wastewater treatment plants. Most PAHs do not dissolve easily in water. They stick to solid particles and settle to the bottoms of lakes or rivers. Microorganisms can break down PAHs in soil or water after a period of weeks to months. In soils, PAHs are most likely to stick tightly to particles; certain PAHs move through soil to contaminate underground water. PAH contents of plants and animals may be much higher than PAH contents of soil or water in which they live. What is the connection between PAHs and human health? 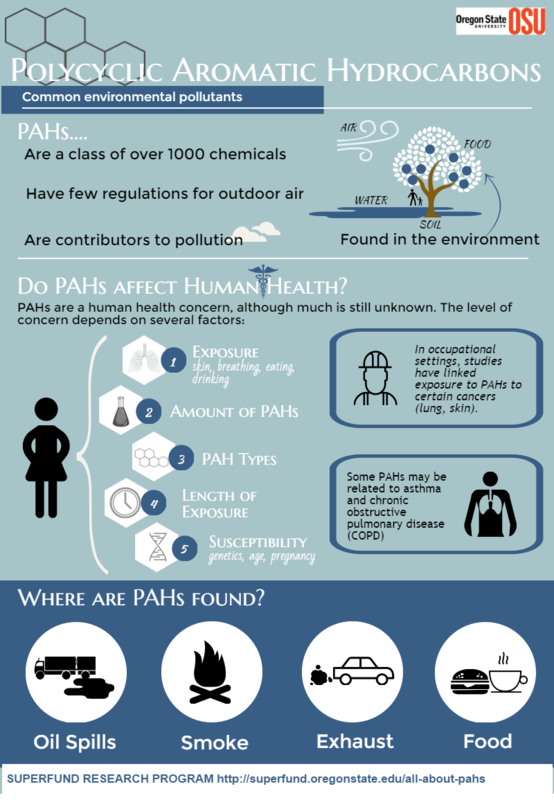 PAHs are a human health concern. A number of studies show increased incidence of cancer (lung, skin, and urinary cancers) in humans exposed to PAH mixtures. Many individual PAH compounds have been classified as probable or possible carcinogens by entities such as the National Toxicology Program and the Environmental Protection Agency (EPA). The effects on human health will depend mainly on the extent of exposure (length of time, etc), the amount one is exposed to (or concentration), the innate toxicity of the PAHs and whether exposure occurs via inhalation, ingestion or skin contact. A variety of other factors can also affect health impacts from such exposure, including pre-existing health status and age. The ability of PAHs to induce short-term health effects in humans is not clear. Occupational exposures to high levels of pollutant mixtures containing PAHs has resulted in symptoms such as eye irritation, nausea, vomiting, diarrhea and confusion. However, it is not known which of the mixture components were causing these effects. Mixtures of PAHs are known to cause skin effects in animals and humans such as irritation and inflammation. Anthracene, benzo(a)pyrene and naphthalene are direct skin irritants while anthracene and benzo(a)pyrene are reported to be skin sensitizers, i.e. cause an allergic skin response in animals and humans. and click on the Health Effects. How might I be exposed to PAHs? Breathing air containing PAHs in the workplace of coking, coal-tar, and asphalt production plants; smokehouses; and municipal trash incineration facilities. 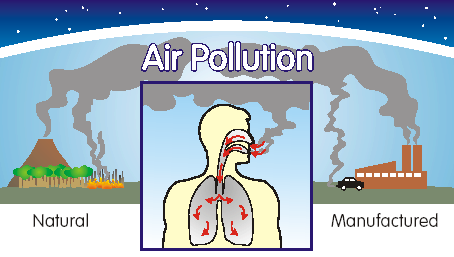 Breathing air containing PAHs from cigarette smoke, wood smoke, vehicle exhausts, asphalt roads, or agricultural burn smoke. Coming in contact with air, water, or soil near hazardous waste sites. Eating grilled or charred meats; contaminated cereals, flour, bread, vegetables, fruits, meats; and processed or pickled foods. Drinking contaminated water or cow's milk. Nursing infants of mothers living near hazardous waste sites may be exposed to PAHs through their mother's milk. What can I do to minimize my exposure to PAHs? Since PAHs are found throughout the environment, it is difficult to avoid exposure. However, you can significantly reduce exposure by avoiding certain areas and by modifying some home and recreational activities. The following are practical and easy steps you can follow to reduce PAH exposure. Avoid smoke from wood fires, whether from home heating or for recreational purposes. Avoid exposure to automobile exhaust and areas of high traffic congestion. Avoid areas where asphalt road construction or tar roofing is occurring. If you smoke, smoke outdoors and in areas away from children. Avoid areas where your child may be exposed to secondhand smoke. Prepare foods by slower cooking over low heat, rather than by charring or grilling food. Avoid skin contact with soot. Note: Workers involved at the oil spill cleanup sites are covered by OSHA's Hazardous Waste Operations and Emergency Response standard (1910.120 and 1926.65). This standard requires that workers be provided protective equipment and special training by specially trained personnel who have received extensive training. This 3D animation shows how the heat from tobacco combustion causes molecules to fragment into unstable arrangements, which recombine to form carcinogenic compounds of polycyclic aromatic hydrocarbons. Staci Simonich on Oregon Public Radio News - How Pristine Are Our National Parks? Listen. Contaminants in the Environment: How can I be exposed? How Do Scientists Study Contaminants in the Environment? Something in the Air: A chemist travels the globe tracking airborne chemicals that end up in us. Is the Coast Clear? Researchers assess Gulf water and air. Zebrafish: Tiny see-through fish offer a model for understanding human health.